Sydney Shop Girl: The Wedding. The Dresses. The Big Issues. The Wedding. The Dresses. The Big Issues. Of course today's post is all about The Wedding. The ceremony began at 9pm local time in Sydney which explains why many of us with children were at home in their pyjamas and ugg boots watching live on YouTube (Today, you did an ace job). Reality bites ..... as they said back in the day. I'm still gutted that I did't catch Tish and Cord's (aka Molly Shannon and Will Ferrell) live coverage of proceedings but you can get the highlights here. For a local and hilariously insightful run down of the ceremony, you have to read James Weir's commentary here. 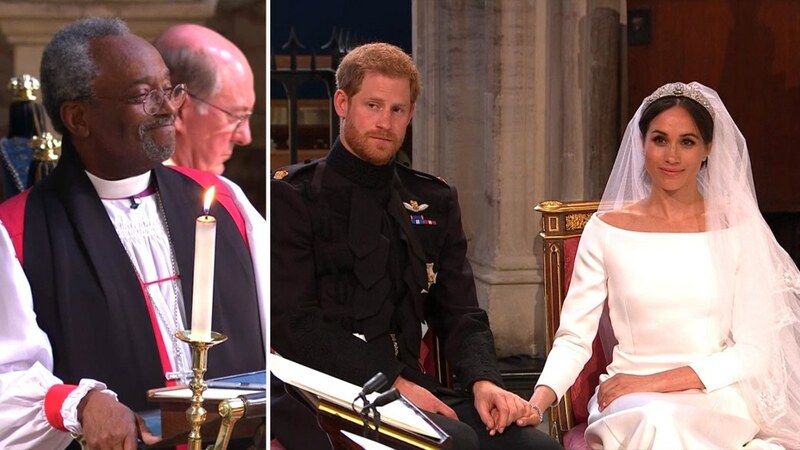 Jokes aside, there were so many things that set this Royal Wedding apart from those that have preceded it. Powerful statements were made about race, gender, inclusiveness, the established 'ideal' of the nuclear family and the role of its members in a wedding ceremony and elements of America's slave history that we should never forget or seek to minimise. You can read Bishop Curry's scene stealing sermon in full here. But above all, the wedding was about love, happiness and family. I like to think that Diana is up there looking down on her boys with a deep sense of love and pride for the men that they have become. There's so much for social commentators and journalists to discuss but for the likes of myself, the wedding was all about the guests and the fashion. The Queen and Prince Philip are goals. To be 92 and 97 respectively and in such good shape is inspiring. The gown. Meghan's gown. It looked so beautiful with Queen Mary's tiara on the drive to Windsor Castle. I loved how simple the Clare Wight Keller for Givenchy gown was, it was a perfect 'back drop' for the tiara and that veil. But gee I would have loved to have seen a bit of lace or crystal in the gown somewhere. From some angles, the boat neck and bodice looked a bit ordinary but then when I look at Meghan in other photos, everything sits perfectly. No sitting on the fence about gown #2 by Stella McCartney. 11/10 from me. One of my favourite royal wedding photos ever. And Amal. With George at her side. In mustard Stella McCartney. My favourite guest outfit of the day. Followed closely by Victoria Beckham in a dress of her own design. Royal Wedding preparation at SSG Manor 2.0 was decidedly low key and priority focused. Hence the champagne in the fridge and the unboxing of one of my Jamie Oliver plates. From the days at Woolies where you had to collect all those stickers to stick on sheets to then redeem for individual pieces of Jamie china. All my wedding prep was done at ungodly hours of the night or early morning. Hence the horribly yellow toned photos. Here's the plate in all its glory. It was just the thing for a cheese plate for one. The palace grounds front courtyard was swept and relieved of about a fortnight's worth of autumn leaves. I was even wearing my 'By Appointment to Her Majesty' Hunter wellies as I went about the raking. True to the spirit of a mum who has way less time to spend planning her Royal Wedding viewing than she did when big brother William got married, may I present the ingredients for my Harry and Meghan Bellinis. The peach schnapps is wonderfully fragrant with just the right amount of sweetness (not to mention a lot less labour intensive than making a sugar syrup). 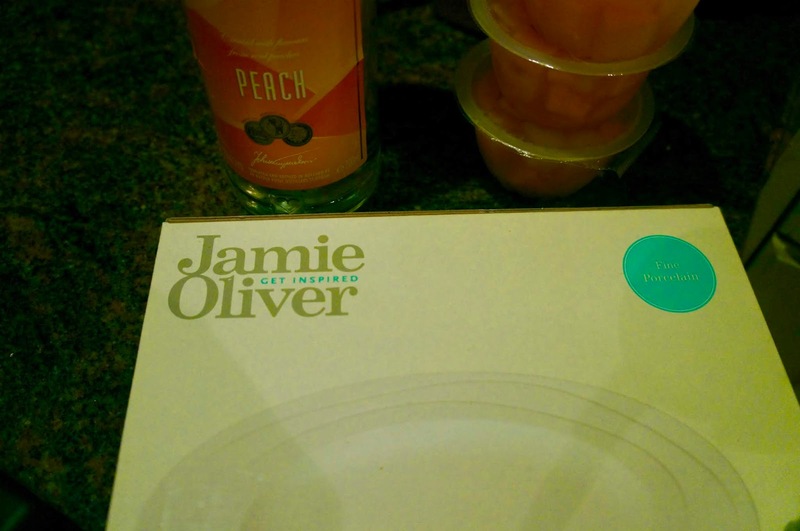 And well, the peach puree? 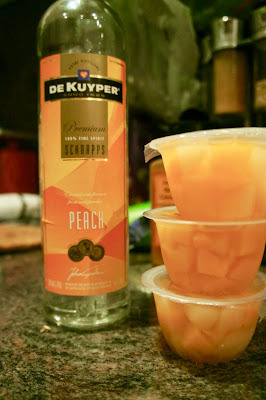 That was 3 tubs of kids snack packs of diced peach and pear in natural juice. It worked out better than you might suppose. 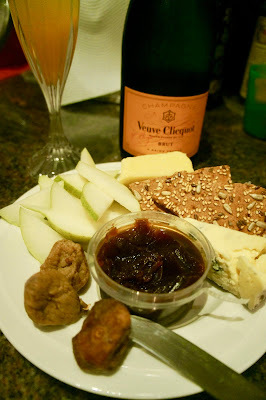 Here's my cheese plate - organic dried figs and fresh pear slices! Very fancy. Dinner made in my trusty Le Creuset stoneware roasting tray. So worth the money, It always washes to perfect, as new cleanness. And this was dinner. 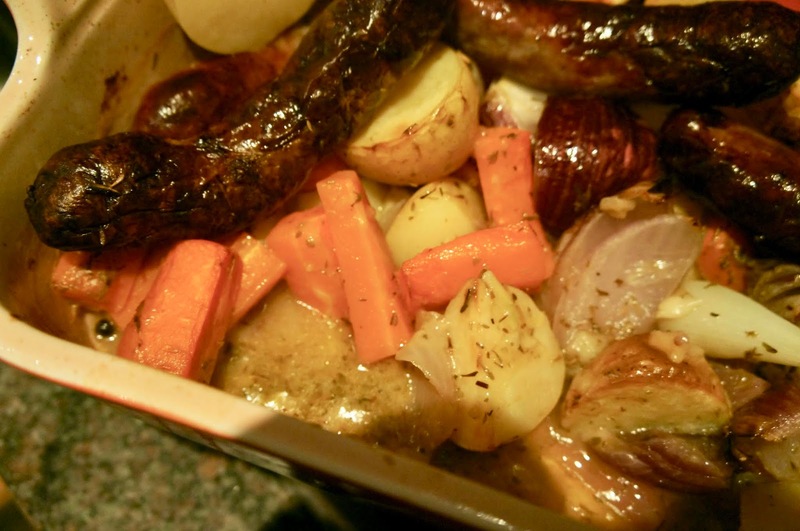 A kind of bangers and mash but only using one pan and the oven, it's Recipe Tin Eats' 'Sausage Bake With Potatoes and Gravy'. Thank you Nagi for another brilliant recipe. 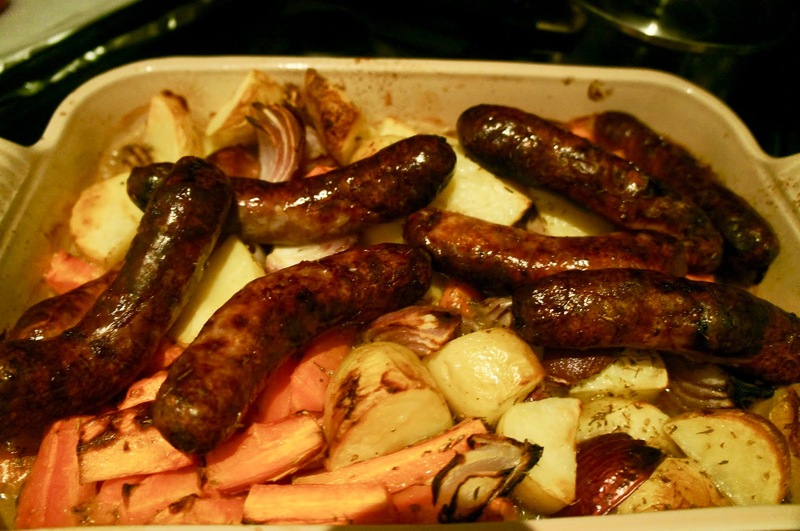 This sausage tray bake is genius on so many levels. You even make the gravy in the pan as the sausages and vegetables cook. Did you watch The Wedding? Did you do so with champagne and cheese while wearing flannel pajamas and ugg boots? Did you feel underdressed or did you have no shame? Did you 'celebrate' in the manner of a parent with young children or did you go all out? I didn't watch the royal wedding but it's been interesting seeing all the excitement over it - the little pieces of the outfits I've seen on social media looked great! :) Glad you had a fun night watching it! I didn't watch the royal wedding but read about it after it took place. Your preparation was 10/10. Funniest meme about the DoE: “he looks really good for somebody who died two weeks ago”. I have to admit I shuddered seeing him walk but a stick won’t do. 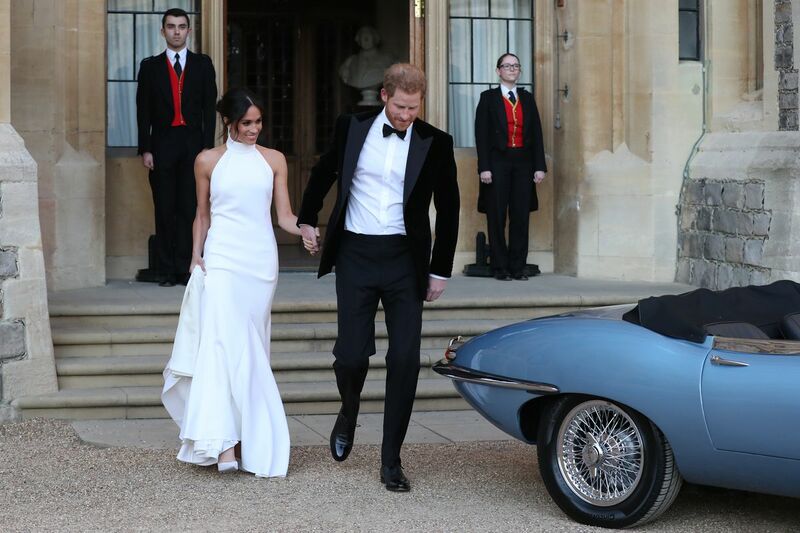 I agree w you re meghan’s Wedding dress, tho I thought the Stella she wore afterward looked a bit loose, like it was wearing her. Life This Week 21/5/2018: My Biggest Fear. Lovin' Life 17/5/2018: Mother's Day. Life This Week 14/5/2018: Show Us Your Snaps. It's Proper Cold In Sydney. Finally. Lovin' Life 10/5/2018: The Sunrise. Turning That Frown Upside Down. Life This Week 7/5/2018: The A - L of Me! Lovin' Life 3/5/2018: Heel Lock Laces.